ANKARA - Turkish President Recep Tayyip Erdogan has urged U.S. President Barack Obama to take a firm stand against the death of three Muslims at the residential complex of the North Carolina State University. 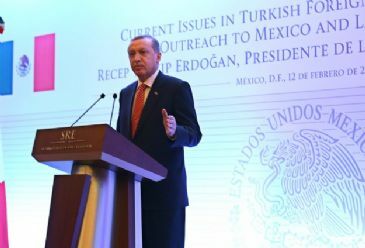 Erdogan, delivering a speech at Mexico's Matias Romero Institute on Thursday, Feb. 12, called on President Obama, Vice President Joe Biden and Secretary of State John Kerry to condemn the murder in a statement. "Why are you still keeping silent?” he asked, stressing that he has been waiting to hear their voice on the incident, which he called an "act of cruelty." Three young Muslims from the same family, with two being married, were shot dead Wednesday at the residential complex of the North Carolina State University in the U.S.
Police named the victims as 23-year-old Deah Shaddy Barakat, his wife, Yusor Mohammad Abu-Salha, 21, and her sister, Razan Mohammad Abu-Salha, 19. Erdogan cursed the suspect, 46-year-old Craig Stephen Hicks, who was charged with three counts of murder. "An international fight against terrorism is a must," the president stressed, "Both anti-Semitism and Islamophobia are crimes against humanity." Erdogan also said that the U.N. Security Council was not fulfilling its responsibility to humanity and that "such a system cannot provide justice." More countries from across the world's continents should be represented in the U.N. Security Council, Erdogan said. "The permanent members only represent Europe, America, and Asia; there is no country representing the Muslim world." The U.N. Security Council consists of 15 members, with Russia, the U.K., the U.S., France and China serving as the body's five permanent members. The non-permanent members are elected for two-year terms by the U.N. General Assembly. Erdogan also repeated his famous statement that "the world is bigger than five," in reference to the Security Council's permanent members who can veto any resolution. "The fate of all other countries across the world cannot depend on what the current permanent members have to say," he added. The Turkish president suggested that membership should rotate periodically, taking into account various ethnicities and religions. Stating that Turkey and Mexico have similar economies in terms of scale, with good economic potentials and young populations, Erdogan said the two countries have the potential to increase their bilateral trade beyond $5 billion by 2023. Prior to his address at Matias Romero Institute, Erdogan had attended a banquet at Mexico's presidential palace following his tete-a-tete meeting with Mexican President Enrique Pena Nieto and a meeting between delegations. Speaking at the banquet, Nieto voiced their "absolute" support for Turkey in multinational platforms and partnerships, as well as in Turkey's G20 presidency. Mexico is the last destination of the Turkish president’s Latin America tour that seeks to boost business and cultural ties. Cuba was his second stop after Columbia. Erdogan is returning to Turkey on Friday, after his last day schedule for cultural visit to Teotihuacan pyramids was canceled.